MPG-o-Matic 2012 Hyundai Veloster Review Summary: The 2012 Hyundai Veloster hits the sweet spot with style, ride and technology and falls just a wee bit short when it comes to oomph, efficiency and creature comforts. Shortcomings aside, the Veloster is a huge hit in an Eco Sport segment that includes the Chevy Sonic Turbo, Ford Fiesta, Honda CR-Z hybrid, and Fiat 500. 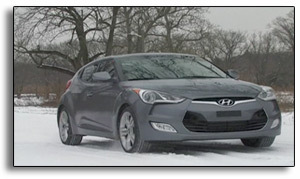 Further refinement and more horsepower are due for the Veloster in the 2013 model year for those willing to save a few dollars more and wait. The Veloster is equipped with a direct-injected 16-valve Dual-CVVT 1.6-liter inline four-cylinder engine producing 138 horsepower (HP) and 123 foot pounds of torque. A six-speed manual transmission is standard, while a six-speed dual-clutch automatic with paddle shifters is optional. 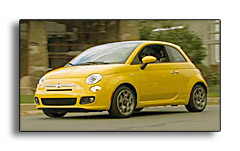 A significantly more powerful turbocharged engine is in the works for 2013. 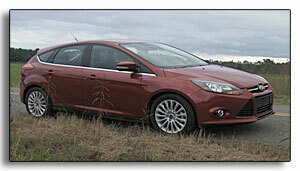 When you compare the 2012 Ford Focus to the previous year’s model, the differences are remarkable. Remove their badges and you wouldn’t guess the two cars share the same name. The 2012 Focus looks, feels and drives like a European car that just happens to be built at a Michigan Assembly Plant … because, in fact, it is. While it falls a wee bit short of the fuel economy claims of its rivals, the new Focus is truly world class. What a difference a year makes. 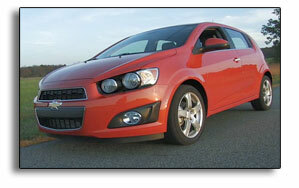 While the outgoing Chevy Aveo ranked at the bottom of all the cars we’ve tested over the years, the brand new 2012 Sonic LTZ Turbo has muscled its way into the top of the sub-compact class. If you’re shopping for a high-MPG sub-compact, your short list just got longer. The Sonic Turbo is a blast to drive and American-built, to boot.